You are going to embark on a construction project – now what? Perhaps the first major decision that must be made is what type of project delivery method you will use. Project delivery method refers to the process that will be followed in selecting design and construction professionals on your project, the design and specifications of your project, and ultimately the completion of your project. While there are variations among the definitions, there are three main delivery methods. This guide is not intended to be comprehensive, but rather to give you a general understanding of the types and how they differ. If we can be of any assistance to you in further explaining your options, please do not hesitate to give us a call or contact us here. With this delivery method, the Owner selects one entity to handle both the design and the construction of a project. There is one contract for the Owner, and the Design Builder in turn holds the contracts with the architectural partner, subcontractors, and other vendors and professionals. This allows for a streamlined point of contact for the Owner and minimizes Owner risk for the project. The Design Builder will be responsible to manage the project from start to finish, creating a cohesive and collaborative team. The Owner generally experiences fewer change orders, reduced administrative burdens, lower overall project costs, and fewer disputes that result in litigation (citation: Design-Build Institute of America). Additionally, this method is typically more efficient in that design changes can be vetted and executed more quickly. 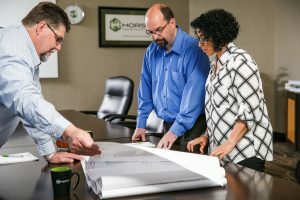 Design-Build is our preferred method for construction here at Horst. We find that we can achieve the best project outcomes because this method allows for the most collaborative and client-focused process. One of the greatest benefits to utilizing this method with Horst Construction is that we offer a Guaranteed Maximum Price with this delivery method. This means you have accurate, detailed information about the cost of your project before construction begins – not to mention peace of mind. This terminology refers to the sequential phasing of this method, which many people call the “traditional” construction project method. It begins with selecting an architect and completing design on the project. This is followed by selection of a general contractor through the bid process. The Owner holds the contract for both the architectural partner and the construction partner, separately. The architect works to independently manage the design and the construction partner is responsible for the management of the construction of the project. This is the method that many Owners are most familiar with, and because multiple bids are solicited, it provides the sense that an Owner is getting the best possible price. However, this method does have its limitations. The Owner will need to allot for more time and energy spent managing the project and the process, will hold responsibility for project execution, and is certainly at risk for more change orders. Additionally, the architect and construction partner can sometimes have disagreements because they are working somewhat independently from one another. This method is less collaborative and more competitive, by nature. Lastly, because the Owner is independently approving the architect’s drawings, the liability for any misalignment of plans and construction specifications falls to the Owner. With this delivery method, the construction manager (CM) is selected at the beginning, prior to the architect designing the project. In some cases, the CM will help the Owner select the architect, while in others the Owner will select the architect on their own. The CM and architect then work together during the design phase, with the CM acting as a consultant to the Owner. The Owner holds each contract separately, and there is ultimately no contractual responsibility for the architect to follow the advice or direction provided by the CM. Once the construction begins, the CM transitions to acting as general contractor (GC) and completes the construction work on the project. Because the Owner holds the contracts separately, there is a responsibility of the Owner to act as the go-between and help facilitate the needs of each party during the process. There is a potential for disputes and assumptions. Additionally, the Owner is responsible for changes and document completeness because the CM/GC and architect are not contractually obligated to one another in any way. Since Horst Construction is a full-service construction company, we complete projects using all delivery methods. We would love the opportunity to discuss your individual project needs and how we can help you achieve your vision. Please give us a call or contact us here.